Country Road - Each day I go for a walk that includes this gravel road. I live in a suburb of St. Paul, Minnesota. Each day (or night) I take a 4 1/2 mile walk that includes both suburban landscape and disappearing farmland. My walk includes Mile Drive, an apt-named mile long gravel road just outside the MUSA line. MUSA stands for Metropolitan Urban Service Area. If you build outside the MUSA line it means you can't connect to city sewer. The fields surrounding Mile Drive are slated to become residential development in 2009. 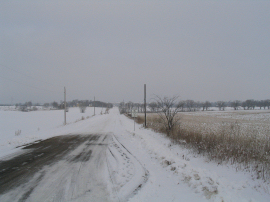 Here, in the year 2006, are my one years' worth of pictures and observations along a still-rural road running through farmland destined to be destroyed for more suburb. My aim is to preserve the memory of Mile Drive as it was. Below is the satellite view of the walk.